I never thought I'd see the day when I would publish the word "tweet" (no less in a headline). 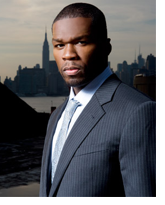 Nor did I think I'd see the day when superstar hip-hop artist/actor 50 Cent would become a financial advisor. Well, Fiddy lives, and he a whole lot richer (he made $50 mill) -- and you are too (and are partying like it's your birfday) if you took his advice. The stock more than doubled yesterday after Fiddy's weekend tweets.